Food Trip: Chez Karine | Viva La Vida! I am such an avid fan of desserts! I always scour the metro for the best places to buy sweets and desserts because usually they are ice breakers for clients and friends during parties, or make great Christmas gifts. Chez Karine bakery is a quaint little French patisserie that opened recently at the Fort. This cute and homey place offers artisanal, seasonal pastries made fresh, from scratch, daily. The place is bright and cheery and it stands out amidst its next door neighbors, Cupcakes by Sonja and Gelatissimo, which are also fierce competitors and established dessert places in the area. Chez Karine’s specialties are their colorful French Macaroons, Royal Puddings, Panna Cotta and little cakes and pastries. They also have a wide range of coffee and tea drinks and go well with their pastries. For my first visit, I decided to get a box of 7 macaroons, one of each flavor – Dark Chocolate, Earl Grey, Salted Caramel, Strawberry, Lemon, Milk Chocolate Passion fruit and Pistachio, and a box of 3 Royal Pudding, also one of each flavor – Chocolate, Muscuvado and Vanilla. First of all, I just love their packaging, especially for the Royal Pudding. Their panna cottas also come in the same jars. Their boxes have cute caricatures for an added personal touch. Even their little cakes have specially shaped boxes for them. As for the macarons, my favorite would be the salted caramel and earl grey. The others are a little on the too sweet side for my taste but their texture is just right. Although I wish they had more flavors to offer. For the Royal Pudding, the muscuvado is my favorite. The chocolate is a little bitter, probably made from dark chocolate, while the vanilla one is a bit too plain. The pudding has the same texture and creaminess as the Filipino dessert, the leche flan, and even has the caramel sauce at the bottom. But I find this dessert expensive at P100 a jar and contains very little. You are probably paying more for the packaging and flavor. 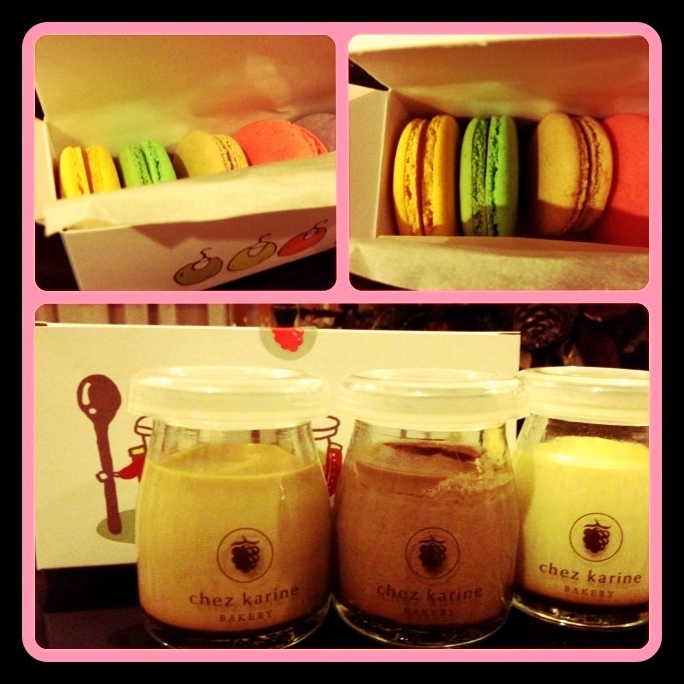 Chez Karine is a very welcome addition to the Serendra area as another great option for dessert or give-aways. Looking forward to trying out their other menu items! This entry was posted in Food Trip and tagged chez karine, food by Roxanne Calingo. Bookmark the permalink.